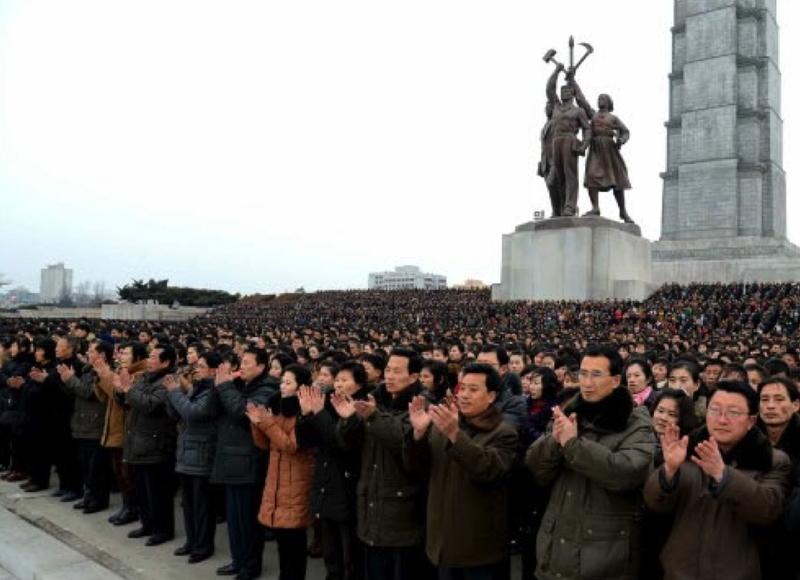 View of Pyongyang citizens in Kim Il Sung Square in central Pyongyang on February 8, 2016 during a mass rally celebrating the launch of the Kwangmyo’nso’ng rocket (Photo: Rodong Sinmun). 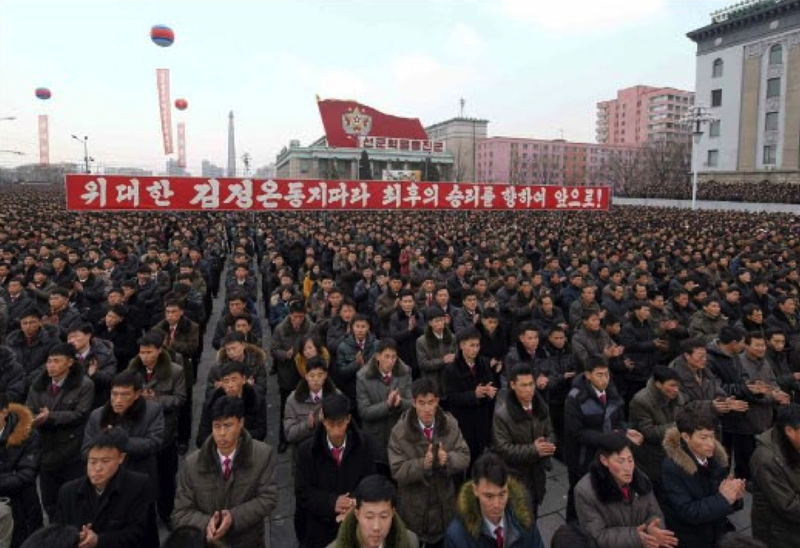 Pyongyang citizens gathered in front of the Chuch’e Tower in east Pyongyang on February 8, 2016 as they gather for a mass rally celebrating the launch of the Kwangmyo’ngso’ng (Photo: Rodong Sinmun). 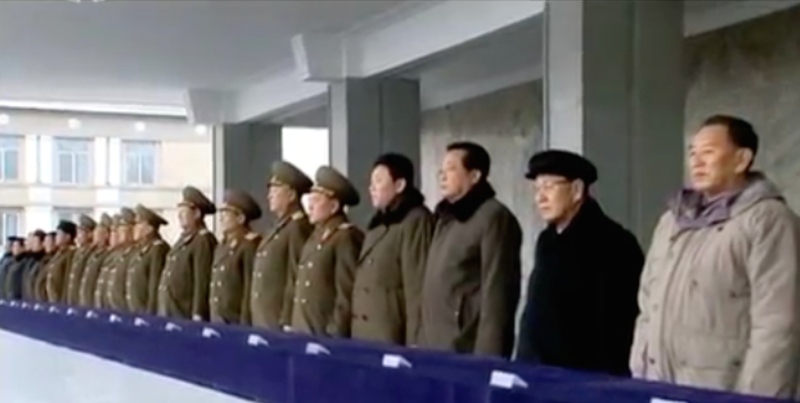 WPK Secretary Kim Yong Chol (right) and WPK Organization Guidance Department Senior Deputy Director Jo Yon Jun (2nd right) with other senior DPRK officials at the mass rally on February 8, 2016 (Photo: KCTV screengrab). Among the DPRK central leadership attending the rally from the platform overlooking KIS Square were: Kim Yong Nam (President of the Supreme People’s Assembly [SPA] Presidium); Pak Pong Ju (DPRK Premier); VMar Hwang Pyong So (Director of the Korean People’s Army [KPA] General Political Department); Choe T’ae Bok (Workers’ Party of Korea [WPK] Secretary for Science and Education and Chairman of the SPA); Kim Ki Nam (WPK Secretary and Director of the Propaganda and Agitation Department); Yang Hyong Sop (Vice President of the SPA Presidium); Gen. Pak Yong Sik (Minister of the People’s Armed Forces); Gen. Ri Myong Su (immediate past Minister of People’s Security and former Director of the KPA General Staff Operations Bureau); O Su Yong (WPK Secretary for Light Industry) ; Kim Yong Chol (WPK Secretary and Director of the United Front Department); Kwak Pom Gi (WPK Secretary and Director of the Planning and Finance Department); Kim P’yo’ng-hae (WPK Secretary and Director of the Cadres’ Affairs Department); Gen. Kim Won Hong (Minister of State Security); Ri Su Yong (Minister of Foreign Affairs); Jo Yon Jun (Senior Deputy Director of the WPK Organization Guidance Department); Ro Tu Chol (Chairman of the State Planning Commission and DPRK Vice Premier); Kim Yong Dae (Chairman of the Korean Social Democratic Party Central Committee); Col. Gen. So Hong Chan (1st Vice Minister of the People’s Armed Forces); Col. Gen. Yun Tong Hyon (Vice Minister of the People’s Armed Forces); Col. Gen. Ro Kwang Chol (Vice Chief of the KPA General Staff); Lt. Gen. Ryom Chol Song (deputy director of the KPA General Political Department and director of the KPA General Propaganda Department); Gen. O Kum Chol (Vice Chief of the KPA General Staff); Kim Su Gil (Chairman of the Pyongyang WPK Committee); Jang Chol (President of the State Academy of Sciences); Ri Chol Man (DPRK Vice Premier); Kim Yong Jin (DPRK Vice Premier); Kim Jong Sun (Chairwoman of the Korean Democratic Women’s Union); Ri Myong Gil (Chairman of the Union of Agricultural Workers of Korea Central Committee); and, Jon Yong Nam (Chairman of the Kim Il Sung Youth League). Also on the platform were senior civilian and military officials involved in the launch of the KMS-4. 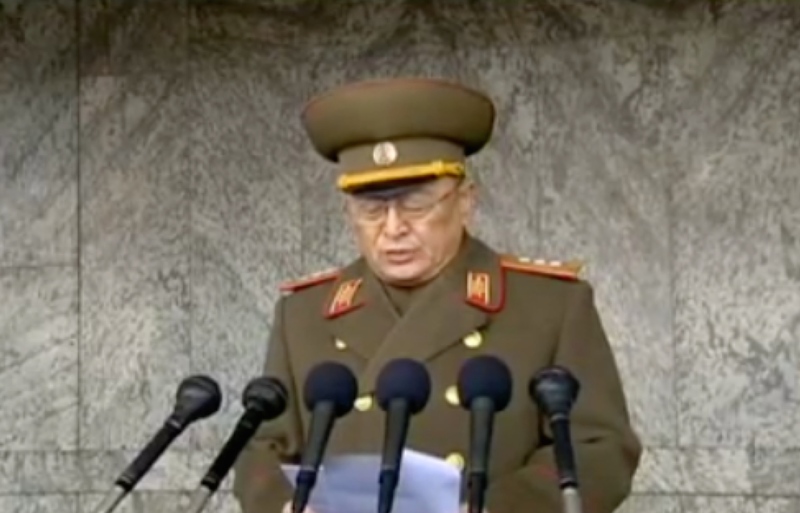 DPRK Premier Pak Pong Ju reads a report about the KMS-4 launch from the DPRK National Aerospace Development Agency at a mass rally in central Pyongyang on February 8, 2016 (Photo: KCTV screengrab). 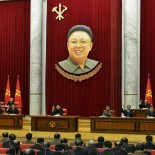 Choe Tae Bok presided over the rally. DPRK Premier Pak Pong Ju read out a report from the DPRK National Aerospace Development Agency [NADA] which was followed by speeches from leading officials of the party, military, science community and youth league. 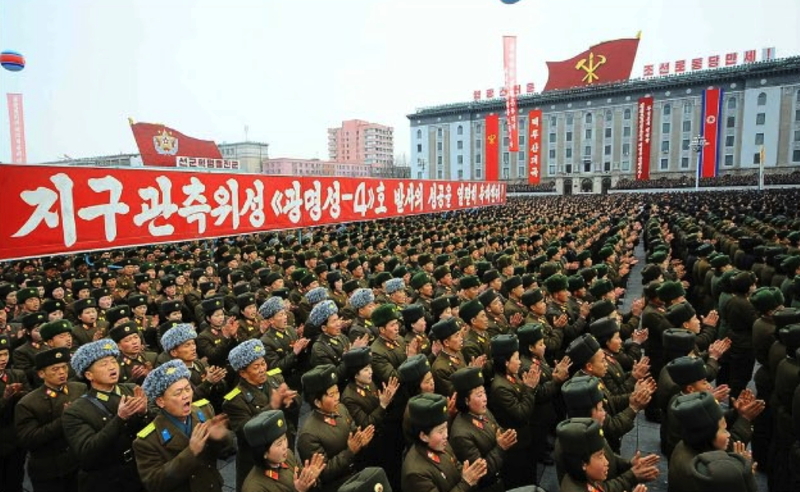 KPA service members applaud during a February 8, 2016 mass rally celebrating the successful launch of the KMS-4 (Photo: Rodong Sinmun). Vice Minister of the People’s Armed Forces Colonel General Yun Tong Hyon reads congratulatory remarks at the February 8, 2016 mass rally (Photo: KCTV screengrab). 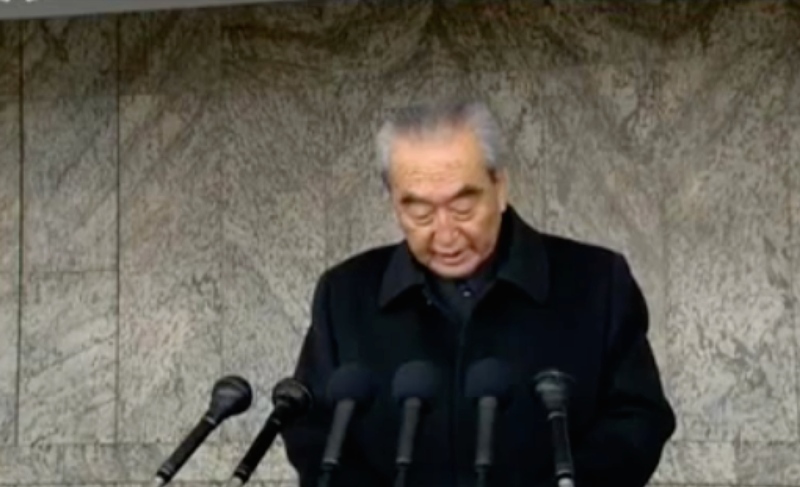 President of the State Academy of Sciences Jang Chol delivers a speech on behalf of DPRK scientists during a mass rally on February 8, 2016 (Photo: KCTV screen grab). DPRK citizens gathered in Kim Il Sung Square for a mass rally celebrating the launch of the KMS-4 (Photo: Rodong Sinmun). 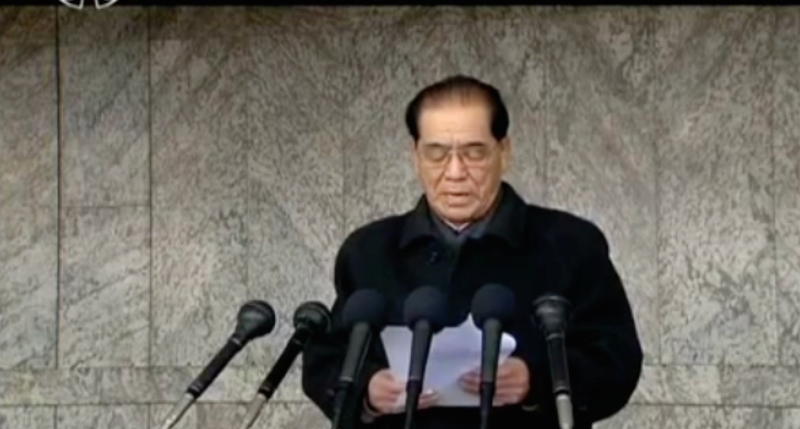 Kim Il Sung Youth League Central Committee Chairman Jon Yong Nam delivers a congratulatory speech at the February 8, 2016 mass rally (Photo: KCTV screen grab). This article was written on 09 Feb 2016, and is filled under "self-development first" slogan, 2016 rocket launch, 2nd Academy of Natural Science, 7th Party Congress, Ballistic Missile Guidance Bureau, Cadre Affairs, Central Committee, Central Military Committee, central party life, Choe Sang Gon (SSTC), Choe Tae Bok, Col. Gen. Kim Hyong Ryong, Col. Gen. No Kwang Chol (KPAGS), Col. Gen. O Kum Chol, Col. Gen. So Hong Chan, Col. Gen. Yun Tong Hyon (MPAF), colonel general, corps command, corps commanders, critical infrastructure, DPRK Cabinet, DPRK Civil Aviation, DPRK External Relations, DPRK Premier, Events Management Section, February 2016 Rocket Launch, Financial Planning Department, Gen. Kang Phyo Yong (MPAF), Gen. Kim Won Hong, Gen. Kim Yong Chol, Gen. Pak Yong Sik (MPAF), Gen. Ri Myong Su, General Federation of Science and Technology of Korea, General Federation of Trade Unions of Korea, gsd, Guard Command, Hwang Pyong So, Hwang Pyong So (GPD; KPA VMAR), ideological slogans, internal security, Jon Sung Hun (DPRK Vice Premier), Jon Yong Nam (KISYL), Ju Yong Gil (GFTUK), Kim Family, Kim Il Sung Youth League, Kim Jong Sun (KDWU), Kim Jong-il, Kim Jong-un, Kim Ki Nam, Kim Ki-nam, Kim Phyong Hae (Cadres/NPYPPC), Kim Yong Jin (DPRK Vice Premier), Kim Yong Nam, kisyl, KJI Personal Secretariat, Korea Committee for Space Technology, Korean Democratic Women's Union, Korean People's Air Force, Korean People's Air Force [KPAF], Korean People's Army Air Force, Korean People's Army Supreme Command, Korean People's Army (KPA), Korean Workers' Party (KWP), KPA General Logistics Department, KPA General Political Bureau, KPA General Political Department, KPA General Propaganda Department, KPA General Staff, KPA Large Combined Units, KPA supernumerary organizations, KPA Supreme Command, KPA WPK Committee, kpif, Kwak Pom Gi, Kwangmyo'ngso'ng 4 (KMS-4), KWP Science and Education Department, local people's committees, Lt. Gen. Kim Su Gil, Lt. Gen. Ryom Chol Song, Machine Building Industry Department, ministry of people's security, Ministry of State Security, Ministry of the People's Armed Forces (MPAF), MPAF GPB, National Academy of Defense Sciences, National Defense Commission (NDC), NDC Administration Department, North Korean press, Organization and Guidance Department, Pak Pong Ju, Pak To Chun, Party elders, party life, Political Bureau, primary party committees, Propaganda and Agitation Department, Provincial Party Committees, Provinicial People's Committee, Pyongyang Defense Command, Ri Chol, Ri Chol Man (DPRK Vice Premier/Minister of AG), Ri Mu Yong (DPRK Vice Premier), Ri Myong Gil (UAWK), Ri Su Yong, Ro Tu Chol, Second Economic Committee, Second Economy Commission, Secretariat, social control, Sohae Space Launching Station, State Academy of Sciences, State Planning Commission (SPC), State Security Department, Supreme People's Assembly, Thae Hyong Chol (KISU President-MOHE), uawk, Unha-3 Carrier Rocket, Workers' and Social Organizations, Yang Hyong Sop, Yun Tong Hyon.